We set the industry standard for custom, top of the line entry doors. 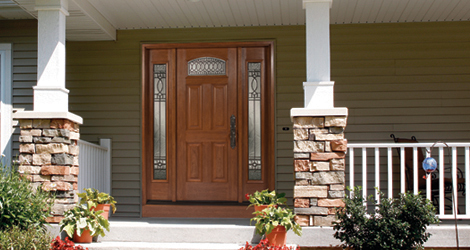 With over 80 available door styles in 5 arch top shapes, our entry doors can accommodate all homeowner needs and wants. We offer the most secure entry doors on the market. Our steel and regency fiberglass doors have a 19” lock block with a 14 gauge steel reinforcement channel. Whether it is a smooth or textured steel the skin is 20-gauge. Our Aspen fiberglass collection boasts a 4″ lock side stile with a 7 gauge steel plate embedded the entire length. To deter rotting, the rails inside of our entry doors are composite. For optimal insulation our doors are injected with high density polyurethane foam filling every nook and cranny. The vinyl thermal break on our steel doors also improves energy efficiency by controlling heat transfer. Thermally broken metal doors are insulated against heat and cold conduction. This is done by separating the outside metal from the inside with a non-conductive material (vinyl). Whether you choose a steel or fiberglass door HMI exceeds your expectations of security, energy efficiency and beauty.